This recipe is simple, quick and easy version of Vietnamese Pho bo that you can make. Pho (pronounced “fuh”) is a noodle soup considered as the national dish of Vietnam. Pho Bo or Beef Pho is the classic. Phở or pho is a soup consisting of broth, rice noodles called bánh phở, a few herbs, and meat, primarily made with either beef or chicken. 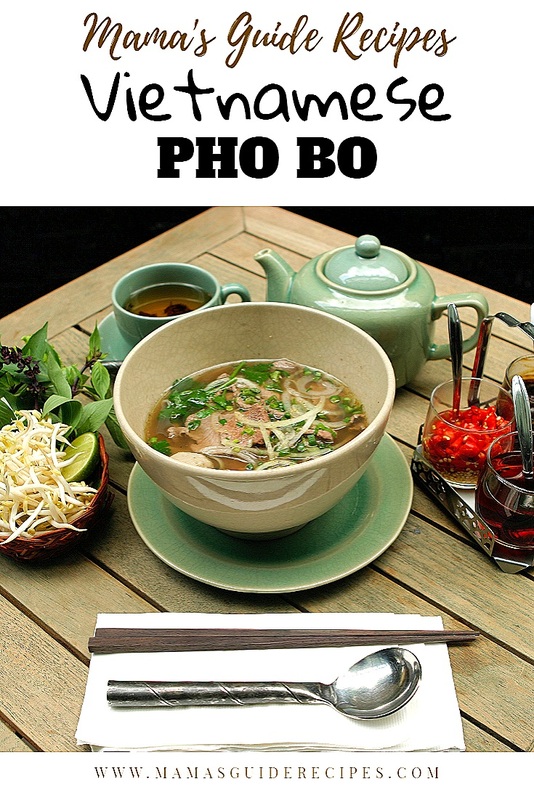 Authentic Pho Bo is basically cooked at low heat for 10 hours with beef bone, beef flank and beef brisket. At the end, the special Vietnamese spices like cinnamon sticks, star anise, cloves, coriander seeds, onions and garlic and more are added then strained. Leaving just the beef and flavoured bone broth. Then added to the prepared vegetables with flat rice noodles. This soup will surely energize your soul, specially on a cold weather. *Available at Asian Markets and now being sold in major supermarkets in International aisle (if in Philippines). In a large pot, bring broth to a boil together with ginger, star anise, and cinnamon. Adjust heat to low and let simmer for about 15 minutes. Prepare and slice sirloin across the grain into very thin slices with a knife. Prepare noodles in a large bowl and soak it in hot water for about 15 minutes (or until softened and pliable). Drain noodles in a colander. Meanwhile, bring a pot of salted water to a boil. Then, add in the noodles in boiling water. Keep stirring for 45 seconds, or until tender. Turn off heat and drain noodles in a colander. Set aside. Strain broth and remove ginger, star anise, and cinnamon. Bring it to a boil. Season with fish sauce, salt and pepper. Add in sirloin, mung bean sprouts and continue to cook for 30-45 seconds or until sirloin changes in color. Skim off any scum that floats on top. Transfer noodles into 4 bowls. Pour in soup over noodles. Garnish with scallion greens, cilantro, chilies and basil over soup and serve with lime wedges, hoisin sauce and sriracha sauce on the side.